No, this firefighter was not watering the lawn. 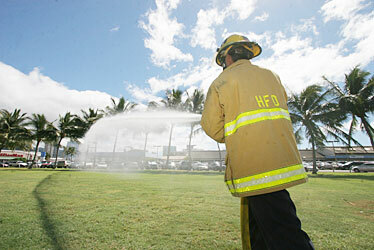 The crew from Pawaa Fire Station was practicing its firefighting techniques and testing its equipment at a park along Ala Moana Boulevard in Kakaako between Ohe and Cooke streets. There were two firetrucks there; one was called away, and five minutes later the other one was also called away on a job. A $350 million satellite providing Air Force communications in the Pacific, including Hawaii, Japan and Southeast Asia, has achieved orbit following a rocket launch Wednesday night from Cape Canaveral, Fla. The Wideband Global SATCOM satellite is the first of at least five satellites scheduled to be placed in orbit by the end of 2008. The satellite system will replace the current Defense Satellite Communications System that has been used for military communications for the last two decades. Col. David Urich, the Military Satellite Communications Systems Wing vice commander, said the first launch alone "will provide more capacity than all the current DSCS satellites currently in use." "Think Pink" and wear some form of pink to qualify for a special drawing at a fundraiser today at Nick's Fishmarket in Waikiki to support the development of Filipinos in Hawaii and raise funds for the Lanakila Meals on Wheels program. The "Think Pink" event, presented by the Honolulu Filipino Junior Chamber of Commerce and Partymasters Hawaii, will be held at 9 p.m. A BCBG Max Azria fashion show, DJ Troy Michael from the Bay Area and complimentary pupus from 9 to 11 p.m. will be featured. Admission is $15 at the door. Attendees must be 21 or older. The meal delivery program for senior citizens on Oahu faced cutbacks due to insufficient funding this past year. U.S. Rep. Neil Abercrombie's office is accepting applications for its 2008 spring page program in Washington, D.C. Applicants must be high school juniors living in Hawaii's 1st Congressional District, which includes Honolulu, Aiea, Pearl City, Mililani, Ewa Beach and most of Waipahu. They also need a 3.0 grade-point average and be 16 years old by the beginning of the page term in January. The student selected for the program, which runs from Jan. 27 to June 6, will live in the House Page Residence Hall on Capitol Hill, attend school at the Library of Congress and work as support staff in the U.S. House of Representatives. Interested students can call 541-2570 for more information. Deadline to apply is Nov. 2. The University of Hawaii Foundation received a $400,000 grant from the Freeman Foundation that will go to the College of Education and the School of Pacific and Asian Studies for the Chinese Language Teacher Education Program. With the shortage of Chinese teachers at K-12 schools across the U.S., UH will become one of the few universities in the country that can produce Chinese-language teachers, according to Chinese-language professor Tao-Chung Yao of the Department of East Asian Languages & Literature in a news release. With the grant, UH will be able to train up to 50 new Chinese-language teachers in the next three years. The money will also create an ongoing teacher preparation program to meet the increasing demand for more such teachers. The state will be processing applications for ID cards tomorrow from 8:30 a.m. to 2 p.m. at Kahuku High School's cafeteria. Fees are $10 for people 65 years or older and $15 for younger applicants. New applicants must provide an original Social Security card and a certified copy of their birth certificate or resident alien card. No documents are required for renewals unless they involve a change in name or citizenship. Applications also will be accepted Oct. 20 at Mitchell Pauole Center and Nov. 3 at Koko Head Elementary School's cafeteria. The master of a University of Hawaii research vessel reported a crack in the fuel tank, which has caused fuel to leak into the water where it is moored at Pier 45 at the Sand Island Treatment Plant. The Coast Guard is monitoring the removal of about 4,400 gallons of diesel fuel. The Coast Guard is investigating the cause and has not yet determined the amount of fuel that has leaked into the water. The master of the Kaimikai-O-Kanaloa, a 198-foot ship, called the Coast Guard at 11:45 a.m. yesterday. The Pacific Environmental Corp. was also contacted to clean up the spill, and was on scene last night continuing to remove the fuel. Police arrested a man who allegedly robbed an off-duty police officer of his car at gunpoint in Kalihi. At about 3 p.m. Wednesday a 31-year-old man called to an off-duty officer, whom he knows, and said he had a gun and wanted to turn himself in, police said. When the officer met with the suspect, the suspect took his vehicle at gunpoint and fled, police said. The suspect was located nearby on the H-1 freeway near the Gulick Avenue overpass. He was arrested on suspicion of first-degree robbery and first-degree terroristic threatening. A 1-year-old Waipahu girl who died Wednesday after being hit by a van in a Waipahu parking lot was identified as Taase Anthony. Police said Anthony darted into the van's path as it was leaving the Times Super Market driveway. Police arrested a 36-year-old man in connection with a machete attack earlier this week. On Monday evening the suspect and a 31-year-old man were arguing at Oneula Beach Park in Ewa Beach, police said. The suspect allegedly struck the victim in the head with a machete, causing extensive injury. The suspect was arrested Wednesday in Wahiawa on suspicion of attempted second-degree murder. Police need help looking for a suspect accused in a bank robbery on Tuesday. At about 3:25 p.m. that day, a man entered the Central Pacific Bank at 2250 Kalakaua Ave. He presented a demand note to a teller and fled with an undisclosed amount of money on foot in an unknown direction. The man is described as in his late 20s or 30s. He is about 5 feet 10 inches to 6 feet tall, weighing from 160 to 180 pounds, with a fair complexion. He was seen wearing a white T-shirt, dark shorts, fedora-style hat, dark glasses and a kukui nut lei. Anyone with information is asked to call Honolulu CrimeStoppers at 955-8300.